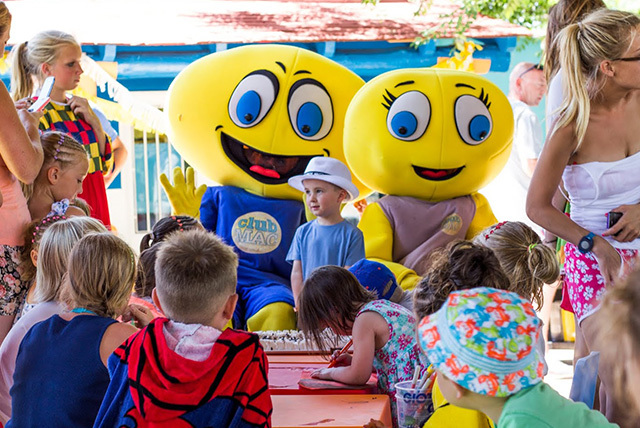 Regular guests to our all-inclusive family fun resort will see some changes for the 2019 season, ranging from what’s included in our rooms to new slides at the Hidropark. And for newcomers, there’s lots to see and discover. Some of the most exciting new additions to Club MAC this summer are the special entertainment days we’re laying on. These are in addition to the normal entertainment schedule, which includes Halloween, the Unicef Youth Day and Environment Day. Everything else on the list below is brand new and designed to light up your holiday with us. Expect the unexpected on the following days throughout the season. Look out for Family MasterChef competitions, world record challenges, tree planting ceremonies, all kinds of fun and games for everyone to join in, food tasting sessions, fun quizzes and contests, special activities just for kids, hilarious sketches by our entertainment team, workshops and parties. These are extra special days where you can expect to see all kinds of fun activities springing up around the resort. As well as these special days, there is, of course, endless entertainment for guests all the way through our season. We open on 1 May 2019 and throughout the season, our team works hard to make your family holiday the best it can be. The season ends on 31 October 2019. Our resort is 100,000 square metres in size, with the three hotels found in the middle of the complex. You’ll be staying at either Saturno, Marte or Jupiter hotel when you come to Club MAC. Whichever hotel is your home for the duration of your holiday, as an all-inclusive Club MAC guest, you’re entitled to eat at any of the three main restaurants. We offer buffet style breakfasts and themed dinners, with a vast array of food to choose from. For lunch you can eat at either Marte or Jupiter restaurants, or help yourself to a burger at the Lake Burger Bar. If you’re still peckish then there are cold and hot snacks and ice cream laid on in our bars throughout the day. Your all-inclusive bracelet also means you can enjoy drinks at our four outdoor bars, situated next to the swimming pools and entertainment zones. Or, you can pop into our two indoor bars if you prefer. At all of our bars you’ll find well-known drinks brands, ranging from San Miguel beer to Pepsi. Check out our website for a rundown of everything we have to offer at Club MAC Alcudia. You’ll find information on everything from our fabulous swimming pools, the Hidropark opposite our complex, how to get to the beach and lots more. We also recommend you download the Club MAC app, which is available for iPhone and Android phones from our website. This is a great tool to show you what’s going on during your stay with us. It’ll tell you the daily menus, entertainment and everything else you need to know to have the best summer ever. Roll on May!